Review: This is a heartfelt look at an unlikely romance that blossoms in the shadow of Earth’s obliteration by a giant asteroid. Both actors give amazing performances with a hard subject to work with. This explores the pain, value, and delight of humanity. The humour and pathos is very well balanced. It is a very sweet and touching film. I love the dog in this. I thought it was a really cute dog. Some film critics have compared this film to a comedy rehash of Melancholia (2011). Nancy Carell stars in this as Steve Carell’s wife, in real life they are husband and wife. 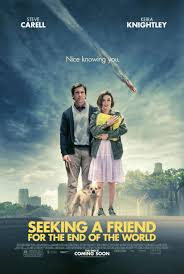 Plot spoiler, the asteroid is never actually seen in the film, only on the movie poster. According to the BBFC website their guidelines state that at “12”/”12A” there is strong language but it must be infrequent. There are over 10 uses of strong language therefore the film is placed at “15”.